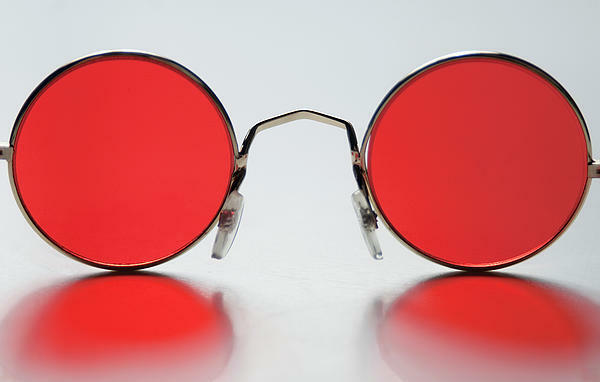 [Everyday] Psychophilosophy » What Color Are Your Glasses? Researchers say that when you first meet someone, you have five minutes to see them as they are, five minutes to see them as the world presents them, before their personality, your interaction with them, colors your perception. Literally, you forever see them differently after that first instant of truth. Now, granted, these variations in perceptions are miniscule–after meeting me, you won’t see a golden aura around my body as much as it makes sense to imagine one–but these differences are there nonetheless. And no matter how hard you try to see that person as he or she is, you will never be able to extract yourself from the mindset that views the person as you currently do. All right, all right–you want some proof of this. Just because I’m a trustworthy source with an infinite well of witticisms, you’re an astute crowd and desire some empirical evidence. Or at least you started reading this post when you thought it was about glasses, and now you don’t want to quit halfway through. Okay, so let’s switch gears and talk about perception in a more empirical manner. For instance, it would be difficult to measure the discrepancy between how you view someone and how the world views someone. What would you use to measure the differences? However, in a case of target shooting, you can have the person’s perceived accuracy and also the objective accuracy. Ooh. Now we’re on to something. Researchers gave participants nerf dart guns and had them shoot at targets of either lovable people (e.g. Ghandi) or despicable people (e.g. the person at OSU who decided we didn’t deserve a snow day today, er, I mean Hitler). And what they found was that participants believed their accuracy was much worse on the liked targets and much better on the disliked ones. But how did the participants actually shoot? They had equal accuracy on both. This same psych article had three other studies with different methodological procedures demonstrating the same effect, that is, when people believed or wanted to believe something, that belief altered their perception of the event. Makes you wonder what you’re seeing differently–what the world really looks like–and if you’ll ever actually be able to access it as it really is. Fortunately, it’s an objective fact (and not some kind of vested interest) that says my writing is marvelously entertaining. You don’t believe me? Just ask my mom and dad. They’ll give you all the objective proof you need. How does this apply to sports teams? I.e., people’s perceptions of a team (for example, Broncos and Seahawks) versus like ability? Petyon Manning is much more likable than Pete Carroll and Richard Sherman, who seem to go out of their way to antagonize people. How much does disliking a team on a broader national level color/effect perception do you think? As the game went along, they had participants try to count how many good plays each team had, how many bad plays, how many poor calls by the ref, etc. So while I don’t have an answer to your question about likability swaying perception (I mean, I do, but my response to your comment is already long enough), it goes to show, no matter the domain–even science!–preconceived intentions will affect your perception.